HPass has developed standards for humanitarian learning and assessment, designed to support providers to review and improve their own services. Through an extensive consultation process drawing on input from learning and assessment providers across six regions, HPass drew together best practice, now finalised in two handbooks: the Humanitarian Learning Standards, and the Standards for Assessment of Humanitarian Competencies. Each handbook contains eight standards, designed to support learning and assessment providers to reflect on and improve delivery of their services. The standards recognise that a wide variety of organisations are involved in the provision of humanitarian learning and assessment, from small providers operating at a local level, to large international NGOs with their own internal learning departments. The handbooks and self-assessment forms can be used internally by organisations to improve their own practice. 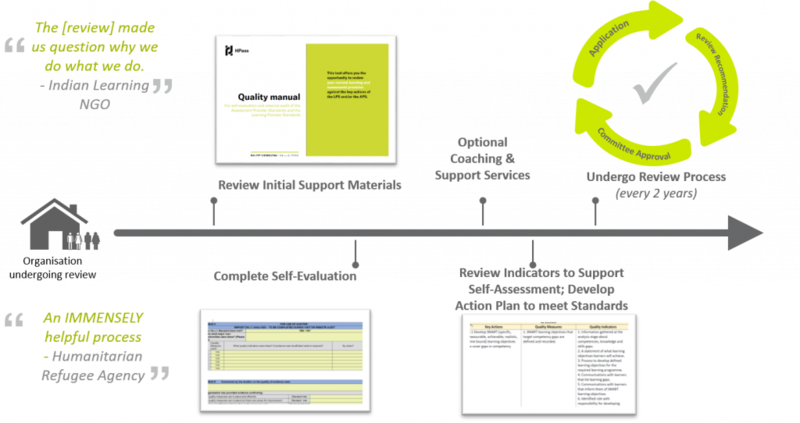 HPass will soon offer the opportunity for an external Quality Review enabling organisations to be assessed against the standards and achieve HPass Approved status. The process of developing the handbooks and Quality Review process was led by Bioforce Institute, RedR and Pearson. Read more about the process here.